Now that you've seen a 360 "before" view of our kitchen, let's tackle two more problem spots for the 28 Day Organizing Challenge. 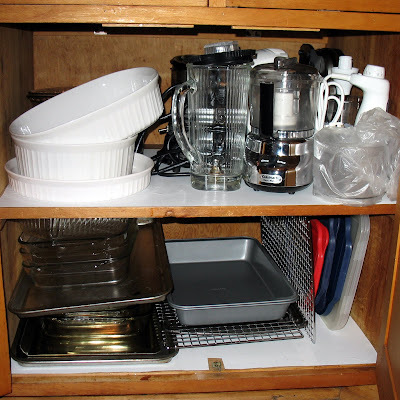 The lower cabinet to the right of our dishwasher houses our small appliances and baking accessories. Stacking and blocking was a huge problem in this cabinet. Each time we would use one of the baking dishes, it would end up shoved back on top of the teetering pile. If we suffered the misfortune of needing something at the bottom of the pile, we had to rearrange the whole cabinet just to find the desired item. Fixing the baking and appliance cabinet required that I also take a hard look at our pots and pans cabinet, which runs perpendicular to the stove. 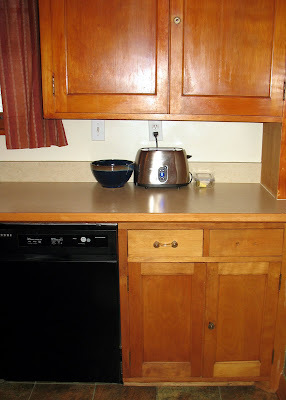 Although the proximity to the stove made this cabinet a logical place to store pots and pans, I didn't enjoy having to crouch down and rearrange the piles at every mealtime. Do I use this item on a regular basis? Do I need this many duplicates of this item (four 8 by 8" baking pans, for example)? Does this item have all of its corresponding parts (baking pans without covers or covers without baking pans, for example)? Everything that I need and use went back into the cabinets. 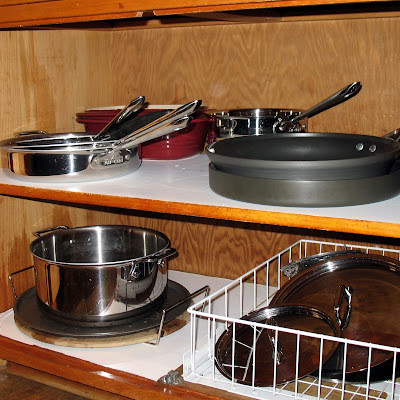 In the one to the right of the dishwasher, I organized the shallow baking dishes and sheets using some inexpensive vertical organizers. Now I can easily see — and reach — the items that I need without rearranging heavy piles. 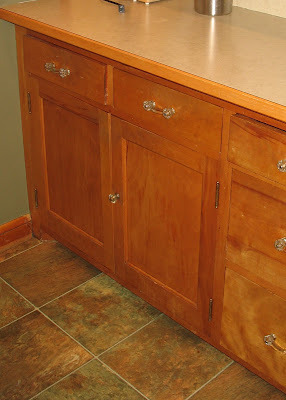 I also put the small appliances into this cabinet. The only change here is that I got rid of my Cuisinart Mini-Prep. I have a new Kitchenaid food processor with a small bowl attachment (you'll see the location of that later), making the Mini-Prep redundant. Appliances in this cabinet include those we use most frequently: an immersion blender, a standing blender, a hand mixer and a waffle iron. In the cabinet that formerly contained my pots and pans, I organized the larger baking dishes, my pizza stone/pan and my dutch oven. 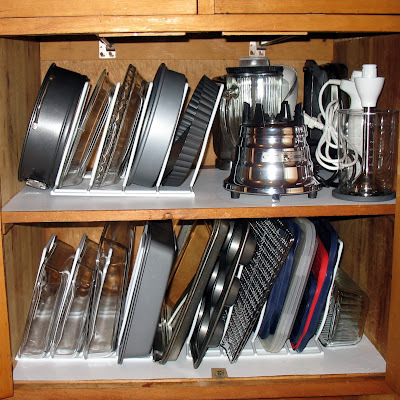 The covers for the pots and pans still sit in the slide-out organizer. 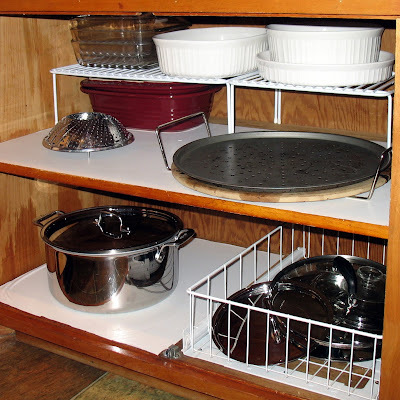 And you can see that some inexpensive wire racks once again help to maximize the space. Distributing my baking accessories, appliances and large pots among two cabinets created significantly more "breathing room." Now, I can see the items I need and remove (and replace) them with ease. I'm super enjoying your organization posts, Angie! I love to organize things and am getting some great ideas. I'm hoping to get one of those wire racks (a tiny one) for my spice cabinet. Seems like the spice I need is always under two others and they are constantly tipping over! It's the little things . . . 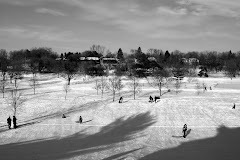 Looking forward to your next post! Will you be doing a bathroom/closet organization tutorial? You are doing an awesome job. When you are done with your house I have one in need of organizing. You have inspired me to get going too. Remember to save any unwanted items for our annual fundraiser, Du-Bar Dolls garage sale this spring. Definitely, Kris! I have a bunch of stuff for the sale now - good stuff, too! Hey Michelle- My bathroom and linen closet still need some serious work, so maybe that will be next!